Congress President Rahul Gandhi during his final address at the party's 84th plenary session launched a scathing attack on Prime Minister Narendra Modi and the BJP government over various issues. The final day of the Congress party's plenary session began in full swing on Sunday at Delhi's Constitution Club, with veteran leader Anand Sharma presenting the international resolution draft. He slammed Modi government's foreign policy, "Never before in Independent India’s history, has the country been so diminished in its immediate periphery,” referring to India’s relations with Pakistan, China, Maldives and Sri Lanka. Congress chief Rahul Gandhi also delivered the inaugural address yesterday, where he emphasised that Congress' symbol was the only symbol that could take India forward. 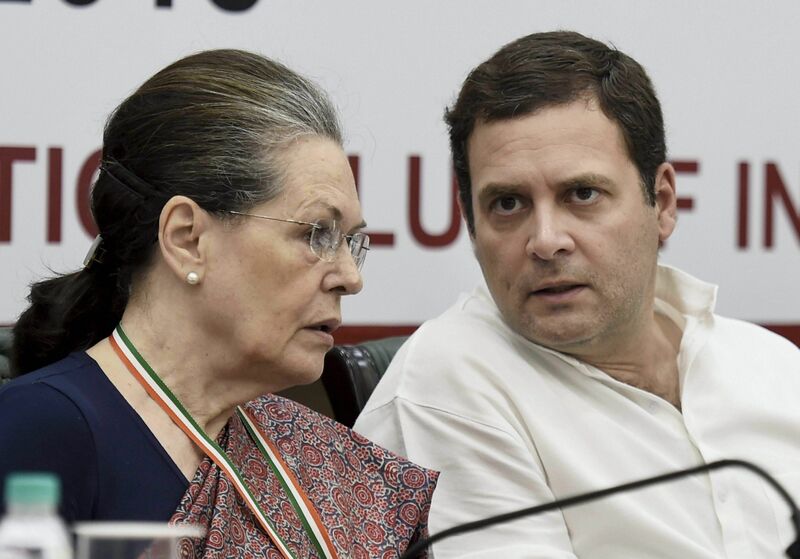 Yesterday, on the second day of the three-day plenary meet, former Congress president Sonia Gandhi launched a scathing attack on Prime Minister Modi, saying his government was 'power-drunk' and the pre-poll promises of combating corruption and ensuring inclusive development were mere "dramebaazi". The aim of the meet is to primarily to set the party’s agenda for 2019, as also to steer its internal structural reforms. 5:00 pm - "Let us put all our differences aside and work together to ensure victory for the party," says Rahul Gandhi before ending his speech. 4:50 pm - "We have to change Congress. There is a wall between our leaders and workers. My first task will be to break that wall. I will consult senior leaders to destroy that wall with love." 4:55 pm - "Congress will take the country forward, but we are humans, we make mistakes. Modi ji thinks he is not human but an incarnation of God." 4:45 pm - We paid Rs 570 crore per plane and Modi paid Rs 1670 crore for the same plane. He paid Rs 1100 crore more per plane. Forget fighter planes, you can’t trust such a man to buy vegetables! Modi is not fighting corruption Modi is corruption: Rahul Gandhi on Rafale deal. 4:40 pm - "The name Modi symbolises the collusion between India’s biggest businessmen and the Prime Minister. Modi gives Modi 30,000 crores of your Money and in turn, Modi gives Modi money for marketing Modi and fighting elections." 4:35 pm - "BJP has spread fear. People fro the press are scared, for the first time we saw four Supreme Court judges running to the public for justice. There is a difference between RSS and Congress, we respect the country's institutions whereas they want to finish them." 4:25 pm - "What does the name 'Modi' actually mean? The name 'Modi' symbolises the collusion between India's biggest crony capitalists and the Prime minister of India." 4:20 pm - "They (people) will accept a man accused of murder as the President of the BJP, but they will never ever accept the same in the Congress Party because they hold Congress in the highest regard." 4:15 pm - "The Prime Minister diverts our attention and jumps from one event to another from Gabbar Singh tax to yoga in Parliament but never talks about the issues. But, the Congress cannot be stopped from seeking the truth and justice." 4:10 pm - "Will India live a lie or will India have the courage to face the truth? Today, the corrupt and powerful control the conversation in the country." 4:05 pm - The BJP is the voice of an organisation and the Congress is the voice of a nation, says Rahul Gandhi. 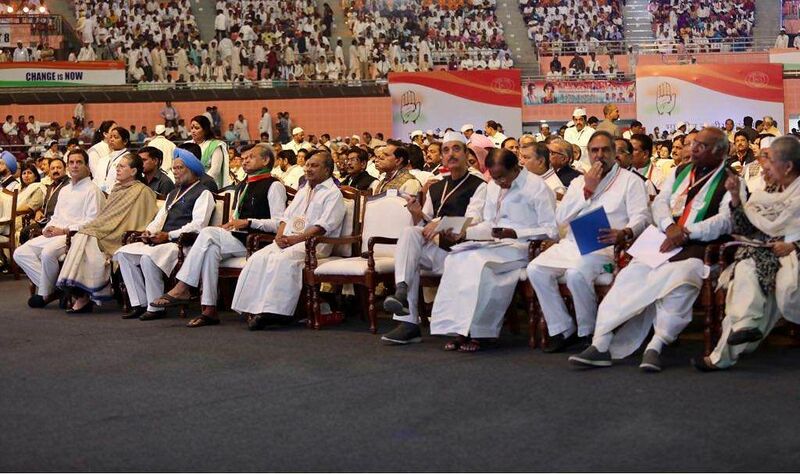 4:00 pm - Rahul Gandhi addresses Congress leaders at the plenary session. 3:20 pm - Economic liberalisation cannot coexist with social polarisation. To build a stronger economy by 2030, a strong public sector is required. Economic institutions today have been eroded, says Jairam Ramesh. 3:10 pm - UPA Chairperson Sonia Gandhi and former Prime Minister Dr Manmohan Singh met with delegates from the Indonesian Democratic Party of Struggle. Sonia Gandhi received a memento from the delegation. 12:20 pm - Former Finance Minister P Chidambaram moves the Resolution on Economics, the second Resolution presented today by the Congress. 12:00 pm - India needs to create an environment that is neighbour friendly. Congress party worked in that direction. We have problems today but they need to be resolved peacefully. Hostile behavior will not help. We must remember that Pakistan is our neigbhour . However, its support to terrorism is not acceptable. We must warn Pakistan that this is problematic to the peace in sub-continent. 12:00 pm - "PM Modi said we will double the farmer's income in 6 years time. If you want to do that, you need a growth rate of 12 per cent oper annum, which is not possible. This is only jumla and tall promises made by PM Modi." 11:55 am - "India needs to recognise the special problems of Jammu and Kashmir and we need to deal with them seriously. The Congress party is the party which led the freedom struggle and guided India after it became free. The party is today invited to play a role in the development. I am confident that under the leadership of Rahul Gandhi, we will play a historic role"
11:52 am - "When Modi ji was campaigning he made lots of tall promises, those promises have not been fulfilled. He said we will provide 2 crore jobs, we have not seen even 2 lakh jobs. Instead problems for created for small-sized businesses and informal sectors"
11:00 am - Assam Congress leader Gaurav Gogoi speaks. 10:46 am - He says, "The PM is carried away by his own propaganda. Today it is a matter of concern that we have mismanaged our relations with major capitals of the world, with major strategic partners and our immediate neighbourhood. The Congress-led UPA Government, in its 10 years in office, pursued a robust foreign policy that enhanced India's standing in the world." 10 am - Today is the final day of the Congress' plenary session. 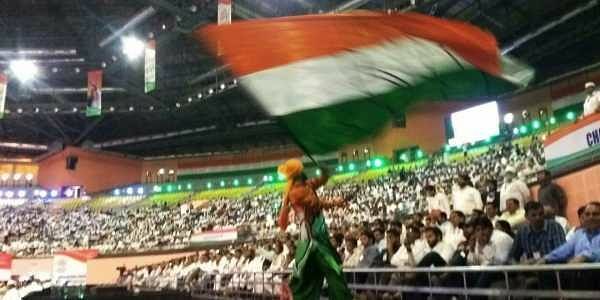 March 17: On the second day of the plenary, Rahul Gandhi inaugurated the session with a brief address, followed by the presentation of the party's political resolution draft ahead of 2019 polls by party veteran Mallikarjun Kharge, a short speech by Rajasthan Congress chief Sachin Pilot and culminated with Sonia Gandhi's hour-long address, where she slammed the Modi government on several fronts.